Thought I just posted a reply to Country, but it didn't seem to take. So here goes again. I probably wouldn't order anything as ordinary as pintos from Rancho Gordo. I stick to the more unusual varieties. The purple runner beans are great with the Nigerian Kidney Bean Stew with Peanut Sauce recipe from Madhur Jaffrey's World Vegetarian. For the Christmas Lima beans, here is a delicious recipe I devised from scratch. This has made me order the Christmas Limas over and over! Place the beans in a large pot and cover with water by about two inches. Bring to a boil, then reduce heat and simmer until the beans are tender (mine took nearly two hours; smaller beans will take significantly less time.) Drain, reserving a half-cup of cooking liquid. Heat the olive oil over medium heat in another dutch oven or very deep skillet. Add the onions and garlic, and saute for 5 minutes. Add the mushrooms and thyme, raise the heat to medium-high and cook for 5 minutes longer, stirring constantly. Add the tomatoes including the puree, crushing the tomatoes with your hands and discarding the hard stem ends. Add the wine, bean cooking liquid, parsley, salt and pepper. Gently stir in the beans. Simmer, partially covered, for about 20 minutes. Jaymes and Cathy, Thanks so much for the recipes. They both look great! And I have, or can get, all the ingredients - which is always something to consider here on the coast of Maine. I'll definitely be trying both recipes and thanks for taking the time to go into such good detail. Patrick, your recipe for the Good Mother Stollards looks great too and I'll give that a try as well. I wasn't familiar with the Russ Parsons method so did a net search and found this - cooking beans with the parsons method. That looks good, but 2 teaspoons of salt per cup of dry beans sounds like way too much. Now to decide which of these great recipes for beans to try first. Decisions, decisions. I've done this many times with many different types of beans. I don't have the problems with salting or soaking that some people report in the thread. It's possible that very hard water, altitude or old beans are the culprits (I live in NYC). - I start off with about a teaspoon of salt per cup, and adjust the seasoning in the middle and at the end. - The "simmer temperature" in your oven may be higher than 250. For me it's 300 (which actually equates to 300 on an oven thermometer, depending on where it's located in the oven). I'd just check the pot to see if it's at the right simmer 15 minutes into the process. - 75 minutes is usually about right for me, but the Stollards took closer to 2 hours. I add the aromatics about 40 minutes into the process. I notice you live in Midcoast Maine. I go to North Haven every summer. Wonderful part of the world. Thanks, Patrick. I checked out a little of the link and will read all of it later. Lots to read. So far as soaking beans - I haven't done that in 10-15 years. I can't remember what recipe I got it from, but it said to bring beans to a boil, turn off heat, and let them sit for an hour before cooking. It's always worked and I've never soaked since. On the salt at the link I gave earlier, I just thought 2 teaspoons per cup of beans would make them way too salty, especially as I rarely add any salt - at any stage of cooking. But for the Stollard's I'll trying adding a little. And for Cathy's recipe since it uses water instead of chicken broth which always has some salt in it. Going to North Haven you must take the ferry from Rockland, which is about 30 minutes from where I am. Midcoast Maine is a great place to be. Where I come from in NH was really nice too, but after being here for 35 years there's no way I could ever again live very far from salt water. Well, the Good Mother Stollards were just phenomenal. I just ordered 3 more pounds of them. Also got runner canellinis, Jacob's Cattle, the midnight blacks, the oregano Indio... and the dried white corn. Since the white corn has been slaked, I wonder if I can grind it in my wet grinder to make masa? Has anyone tried mayacoba beans? I tried some last year and really liked them. The brand I got was Valle Verde. I found this link that tells a little about them. Doesn't $5.50/pound seem a bit excessive? They have a much richer flavor than Canellini or great Northern beans . Are they worth the extra money? It is all a matter of perspective I suppose. I notice lots of food items that cost as much as twice the price of similar items and they taste better but not twice as good. All things considered, to me, $5.50 is not a lot of money even though it may be high compared to more common beans. It's that all their beans are $5.50. 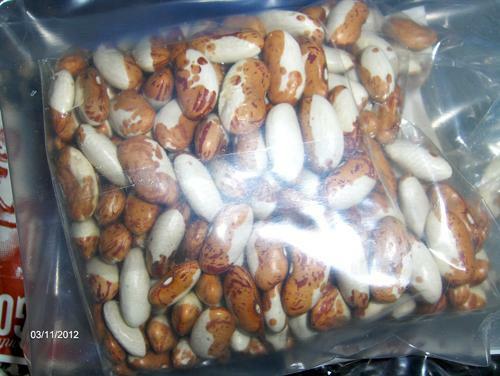 Even ordinary beans such as Canellinis, Pintos and Yellow Eyes. Plus $12 for shipping to East coast. I'd sure hope for that much money they're extra special beans. I was at the local coop today and none of the bulk beans were more than $2, except (organic) Canellinis for $2.29. Got some of those and some Black Eye Peas. Since we're on dry beans, here's an article in the current issue of Maine Organic Farmer & Gardener that's interesting. White Runner Beans – the Northern Gardener’s Lima The author, Will Bonsall, is well known for his work in Maine when it comes to organic gardening. Speaking from previous experience, $5.50/lb. is a fair price when you consider that Rancho Gordo's products are truly excellent, top-of-the-line, quality stuff. In fact, at this price, what you're getting is a bargain. I have a bunch of beans from Cayuga Organics (from Union Square Greenmarket) that I'm slowly finishing off, but as soon as those are gone, I'll order some more from RG. I used the white corn for my NYE batch of pozole, and it was absolutely outstanding....far beyond what I thought was "good" canned hominy. Texturally wonderful, and actually smelled like corn instead of canned water. Also used the runner cannelini's to make the confetti bean spread from the RG cookbook. Great stuff, and while the recipe may sound like it doesn't make that much....it does. Unless you're feeding 50 people, don't go doubling it or something crazy like that. I think this spread would make very good ravioli filling if thinned just a bit. Since I haven't posted in a while I thought I'd follow up on this. A few weeks after I made the post above I tried the Mayocoba's that I got from Rancho Gordo. No better than the Pintos from them. After two disappointing experiences with their beans I gave up on them until now. Jaymes posted a recipe for using the Runner Cannellini's I got from RG, so I thought I'd try her recipe for Pasta e Fagioli because it sounds good. The Cannellini's were even more disappointing than the Pintos and Mayocoba's. I put them in a bowl to wash and a lot were broken shelled. They looked like clams dug by an inexperienced clam digger. But, I thought I'd give them a try and added water to wash. At least a third of them floated - and stayed floating. No good. I've been growing, buying, and cooking dry beans for a long time and I've never had a worse experience with dry beans than I have the one's from Rancho Gordo. I'd hoped for a lot better than this. I'm simply gobsmacked. I've been ordering beans from RG for a few years now and I've never had an experience such as you describe. I just cooked a batch of the Good Mother Stallard beans and only had one floater. Out of a pound of dry beans. I don't have any of the runner cannelini on hand at present but I have had them before and never noticed any appreciable number of broken beans. I currently have these on hand and they are all shiny, clean and except for a couple of halves in the package of Vaqueros, whole. I'll say that my bag of white runner cannelinis was about one-third floaters as well. RG say there was a real shortage of those beans this year, so maybe it's a related problem. That said, the non-floating beans were absolutely delicious. I recently got the garbanzos which were also excellent, along with many more Stallards. Have also bulked up on borlottis and am trying the chiles de arbol. A friend also brought back some heirloom rum beans from Chiapas state which I'm very much looking forward to trying!! 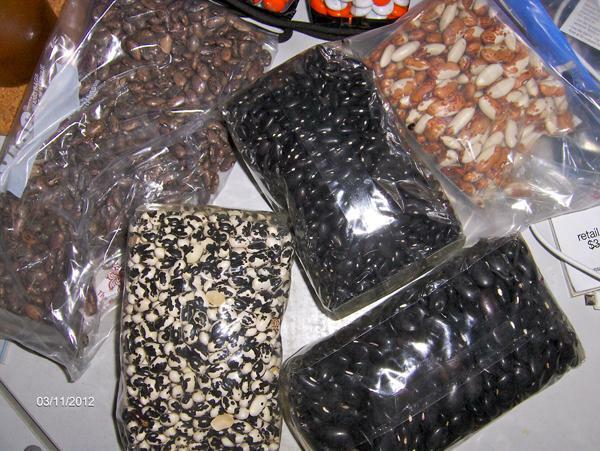 The traditional beans are black turtle beans and I had intended to use them but when I plucked a package from the bean container and popped it open, I found I had grabbed the GMS instead of the Midnights. No matter, these made an excellent substitution. Sufficient garlic, a jalapeno pepper, bay leaves & etc. I served it with greens (collard and mustard) and the usual rice. It's not the "real" thing, but it was very tasty and an excellent use of these beans. Hey Jaymes. This is a GREAT RECIPE! The RG Cannellini's went into the compost bucket but, since I really wanted to try your recipe, I plowed ahead with some Cannellini's I bought a couple of years ago at the coop. Pretty old, but no floaters. The first 30-45 minutes of cooking they were still looking pretty wrinkled, but they came to and were fine. Another reason for plowing ahead was, before I knew the RG's weren't worth cooking, I'd gone up the road to Morse's Sauerkraut to check out the pancetta and ended up getting some prosciutto instead. Black Forest prosciutto. They had Parma there, but it was like $26/pound, and I'd always liked the smokiness of the Black Forest so I stuck with that. That worked out well as the smokiness and salt of the BF really made things come alive, so to speak, in the soup. I used some Contadina crushed tomatoes and store bought celery, but the onion, garlic, and carrot came from last year's garden. The rosemary and thyme came from plants I bring in to the house before things freeze up. I clipped off a bunch of each and put them in stems and all, and took them out after enough had gotten into the soup. Came out just right. So, THANK YOU, THANK YOU! Your recipe worked out better than any other for the first time I tried it and I'll definitely be making it again. I am so tickled that you tried it, and liked it. It's a real favorite around our house. Andie, I got my first order of beans from RG yesterday and placed an order for some beans from Purcell Mountain this morning. I noticed in your picture that you also had some Orca beans. I got some as well but haven't decided what I'm going to do with them. What are you planning for yours? I just read this whole thread and was amused looking back at the bit about cornbread. My mother was raised in the very deep south and she always made her cornbread as her mother did with almost 1/4 white flour and a good tablespoon of sugar. My father who grew up in the far western part of Texas called it "that caky old Yankee cornbread." His mother never used any flour or sugar. Fast forward to now. I used to make cornbread both ways until my wife (who is from one of the Northern Suburbs of Chicago) told me she likes it without the sugar and flour. I guess the moral of this story is "make cornbread anyway that makes sense to you" but I think we can all agree that a good piece of cornbread is great with a bowl of beans! I'm not from the deep south. I was born (at home on the farm) in western Kentucky where there is a lot of "bottomland" where corn produces enormous yields (as does sorghum) and wheat does not do as well. In the old days when wheat flour was scarce and expensive, most people made cornbread for every day and saved the flour for making biscuits (on Sunday) and cakes. The corn was sweet enough without the need to add sugar. There are many variations of cornbread and I like several but I really don't like the "Marie Callender" cake type, it falls apart if you try to pick it up and no way could it be dunked in bean soup - and the flavor wouldn't complement the beans anyway, at least to my taste. Last week I was making a dish from the Heirloom Beans book, Pasta with beans, broccoli babe and bacon, but since my RG order hadn't arrived I had to use something I could get locally. I used Cannellini beans from Bob's Red Mill. I did an overnight soak and they cooked up evenly, quickly and very tasty. Has anyone else used beans from Bob's Red Mill with good results or did I just get lucky? I've lived a lot of places, but my heritage is pretty deep south. And it seems to me that the misunderstanding about what my family also called that sweet "cakey ol' Yankee cornbread" is that, for the most part, Yankees just don't understand the way that southerners eat cornbread. It's just exactly like Andie says. Cornbread in the South traditionally has always been served as a staple - "the bread" - with your meal. Most cultures on the planet serve some sort of savory bread thing with meals. It's not sweetened. Cornbread took the place of unsweetened white bread at the dinner table. That ol' Yankee sweet cakey cornbread, like Marie Callender's, can be plenty tasty when served with butter and molasses or sorghum or something, as a sweet. A dessert. But it's no good when served with your meal. You'd no more serve that sweet cornbread with your greens, beans and ham than you'd serve a Danish with your pork chop and peas. You say it so well, Jaymes. 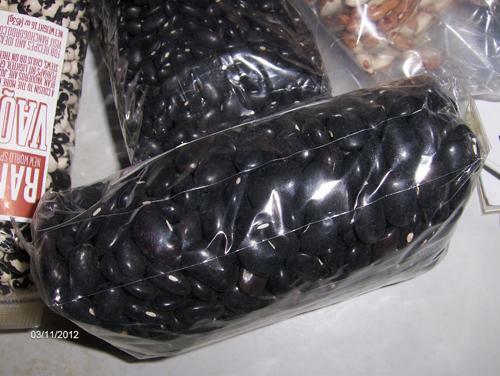 I forgot to answer Charcuterer's question about the beans - The white and black beans are not Orca, they are Vaquero. Okay I got a great gift of Rancho Gordo goodies--bought at the Napa store--for xmas this year, and among the beans was a pack marked "Alubia Boluda,"one of the xoxoc project beans. There ain't a word on the website about them and they are not listed under the bean products. Wazzup, Steve? Anything you can tell me about them before I cook them? Also among the goodies was a pack 0f black valentines. I haven't had them before and they are fabulous. I made a soupy pot of beans, using, among other things, RG oregano indio and NM chili, plus a hit of chilpotle sauce. That was for New Years Eve, and I am looking forward to the leftovers tonight. A really nice bean, now a favorite. Love the black valentines! Got to get some more of those. Curious to try them in the pressure cooker. Me too. My favorite for the traditional Jamaican Black beans and rice dish. Mon, Andie, I want the Jamaican beans and rice recipe please! I would have thought Jamaican recipes used a traditional black bean (like the Midnight) but most of the recipes I checked out specify a red kidney bean. After my first valentine experience I agree with Steve S, that they are much closer to kidney beans in flavor and texture than the traditional black bean. 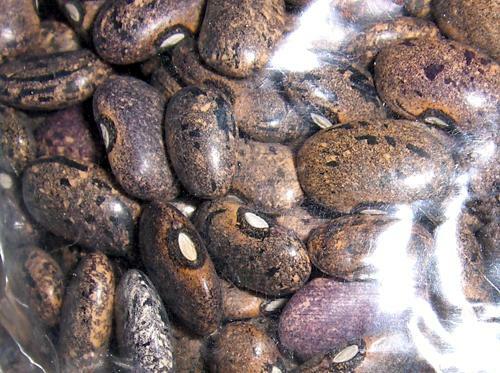 So the valentines would be perfect for a Jamaican bean dish. The bean likker is richer than that of a regular kidney bean. So yummy. I had this hand-written in a notebook had to transcribe it into Word so I can post it here. 4-5 inch stem of fresh thyme or 1/2 to 1 teaspoon dried thyme, depends on how much you like it. Salt about a teaspoon of sea salt. Pick over the beans, wash and soak for two-three hours in heavily salted water. Rinse well… to remove the salt. Cook over high heat till water boils. Reduce heat to simmer and cook until most of the water has been absorbed. Add the coconut milk PLUS 2 cans of water to the pot of beans. Add the green onions, the pepper, thyme and salt. Bring to a simmer and cook for about 15-20 minutes. Meanwhile wash the rice well and soak until the time is up. Drain the rice and add to the bean pot. Cover the pot with a tight lid. Cook over LOW heat for 30 minutes, check after 15-20 minutes to make sure the bottom is not scorching. continue cooking for an additional 10 minutes or so. The dish should be fairly dry - similar to the Cajun red beans and rice. I like to toss in some crisp cooked bacon, or ham or leftover pork roast. My Jamaican friend serves this with jerk chicken or pork along with a fruit salad. Oh man andie, I am definitely trying that Jamaican black beans recipe. Does anyone have a good Dominican red beans and rice recipe? We used to have an incredible Dominican storefront counter here in Manhattan called Sucelt Coffee Shop that served delicious food - their chicken stew with red beans and rice and their homemade (searing) salsa was to die for, and I haven't discovered any comparable place in central NYC since they closed. Not even close - it was a little family run place, the grandmother and the mother and a family staff, and it showed in the care and refinement of what was essentially a steamtable restaurant. I've googled with no luck, and I don't know of any good cookbooks - anyone have some great Dominican bean recipes written down in their notecards, notebooks or Word documents, passed on by friends like andie's? When I am in San Francisco, which is at least twice a year, I always make a point to stop by the RG store in the Ferry Building to pick up several packs of beans. That's one way to get around the cost of ordering. That being said, I don't find the amount prohibitive. Your mileage may vary.